Dobos is a traditional Austro-Hungarian cake, but in the Banat became a true art. It was always present at the great feasts, especially during the celebration dedicated to the patron saint of the church. Should we start with the recipe or with the story? To not arouse immediate desire for the cake, we will start with the story.Dobos is a symbol of abundance in Banat and it cannot be prepared by anyone, because it’s related to art, skill and a little experience. The cake was invented by the Hungarian chef Josef Dobos and initially had a round shape and five layers. Over time, every housewife has shown her own mastery wanted to prove his culinary of gastronomy added something more to the recipe, until the Dobos came to twelve layers and became rectangular. For the dough, we need 6 large eggs, 1 pinch of salt and 6 tablespoons of sugar, 6 tablespoons of flour, 1 tablespoon of vanilla extract. For the cream we need: 400 grams of butter, 6 egg yolks, 250 grams of sugar, 100 grams cocoa, 1 tablespoon vanilla extract. If we want, we can also add 1 tablespoon of brandy. 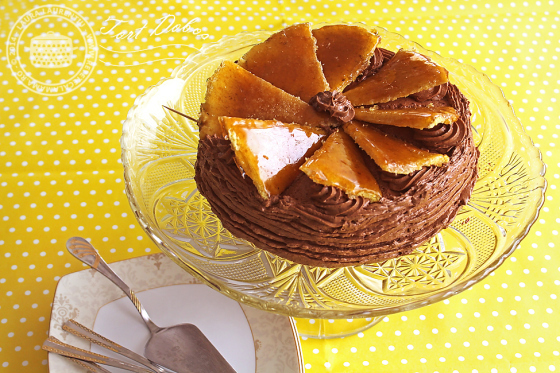 How to prepare Dobos torte? Beat the eggs white until stiff with the salt, gradually add the sugar and continue beating until it becomes a strong meringue and sugar dissolves. Put the egg yolks and mix well with a spatula for cakes. Divide the composition into six parts. Extend the first sheet in a thin layer on baking paper and bake it at a temperature of 180 ° for 5-6 minutes, until it will have a golden color. This operation is repeated for the other five sheets. Leave to cool the sheets, but careful not to stick together. Meanwhile, prepare the cream... Egg yolks, cocoa, vanilla extract, put all in a bowl over a pan of boiling water. Beat with a whisk until the sugar dissolves and when the cream begins to thicken. Leave to cool, then add the diced butter and mix with the mixer. Now it’s time to put the cognac, for those who prefer such a flavor. The cream can be spread on the five of six sheets, trying to get an equal make them equal form. Cover the entire cake with cream and make a simple decoration with the fork. Who can do the final test, ie the caramel crust, receives the Master Chef diploma! Caramelize six tablespoons of sugar, but be careful not to burn it. Pour it over the sixth sheet and stretch it. While the sugar is still hot, the dough is divided into eight equal slices with a knife greased of butter. Do any decorations you like. And obviously, it fits on a holiday table.